The Painting and Decorating Association (PDA) has appointed former MP and Shadow Health Minister Paul Marsden to the role of chief executive officer. Mr Marsden takes control of one of the largest trade bodies in the UK, which represents the interests of thousands of painters and decorators – ranging from large-scale contractors through to sole traders. His priorities for the PDA include raising awareness of the training and making the public aware of the high standards that members need to work to before being allowed in the Association. Mr. Marsden said, “I am delighted and honoured to be given this opportunity to help take forward the PDA. “I am keen to see new opportunities for young people to enter the profession, and secure high training and qualifications, so that the public and clients can be assured of the highest standards of service from a PDA member. “In these tough economic times I shall also be listening to painters and decorators across the country about their concerns and lobbying key decision makers to reduce unnecessary red tape, whilst highlighting the need to drive out the cowboys in the profession". As well as a successful Parliamentary career, which included campaigns for better cancer care and the introduction of innovative road safety measures, the 40-year-old has an extensive background in management consultancy. A Fellow of the Chartered Management Institute and Member of the Institute of Directors, Mr Marsden brings to the role considerable construction industry experience – which included a managerial role at Taylor Woodrow before being elected to Parliament. 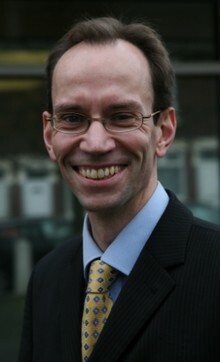 Mr Marsden was the first ever Labour MP to be elected in Shrewsbury, in 1997. He was re-elected with a majority doubled and retired from his Parliamentary career in 2005. Based in Bicton Heath, Shrewsbury, Mr Marsden is a keen historian and author of The Black Friars of Shrewsbury. The Painting and Decorating Association was established in July 2002, following a merger of the British Decorators’ Association and the Painting&Decorating Federation. The British Decorators’ Association was originally founded in 1894. This new organisation is Britain's largest trade body, dedicated to the painting and decorating trade. The PDA is proud of its long history and high standards, and a registered member can be relied upon to do a good professional job at a fair price.